I arrived a bit early and it turns out that a reservation was not necessary. If I thought the place didn't look like much from the outside, the inside was not much better. 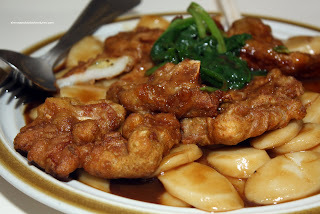 Resembling an old wonton noodle joint, the dining space is purely for function only. Adorning the whole side of the place were menu items, surprising in both Chinese and English. Once again, I was in charge of doing t he ordering since I could speak the language. I had to decipher what the lady was saying to me since it was a mix of Mandarin and Cantonese. 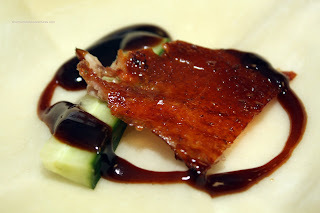 So we started with the aforementioned Peking Duck. It consisted of 2 courses, with the first being the classic crispy skin wrapped in flour crepes. The skin was quite crispy with very little fat or meat attached. It may have been a tad too dry in some areas. Also, I felt it was cut into pieces that were too small. The flour crepes were not very good. They were too thick, cold and gummy. The second course consisted of the Duck Lettuce Wrap. This was better than the duck skin. 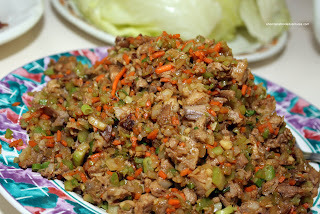 Curiously, the veggies we re crisp; but the overall filling was mushy. I think that there may have been a lack of "wok hay" or wok heat; thus not enough caramelization occurred. That would explain the lack of colour and flavour. Other than that, it wasn't too bad. Now for the litmus test, the Xiao Long Bao. We got 2 orders since one is never enough. Call it unrealistic expectations because I thought they were only alright. I liked the filling and there was enough juice; but (agreeing with Kim) the dumpling skin was a thick and gummy. Don't get me wrong. 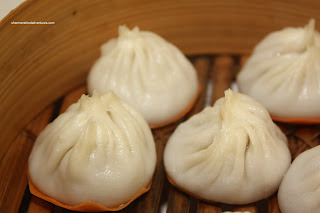 They were more than acceptable, much better than Legendary (which inexplicably were in a XLB competition). We also got 2 orders of the Potstickers. I felt that these were better than the XLB. 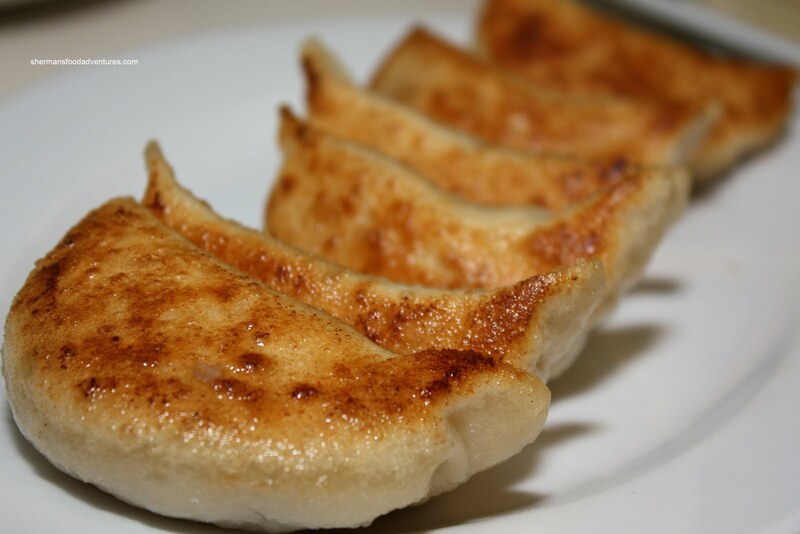 With an appetizing crisp bottom and a surprising amount of juice, the potstickers delivered. I enjoyed both the taste and texture of the filling as well. The meat was not gritty and modestly-seasoned. 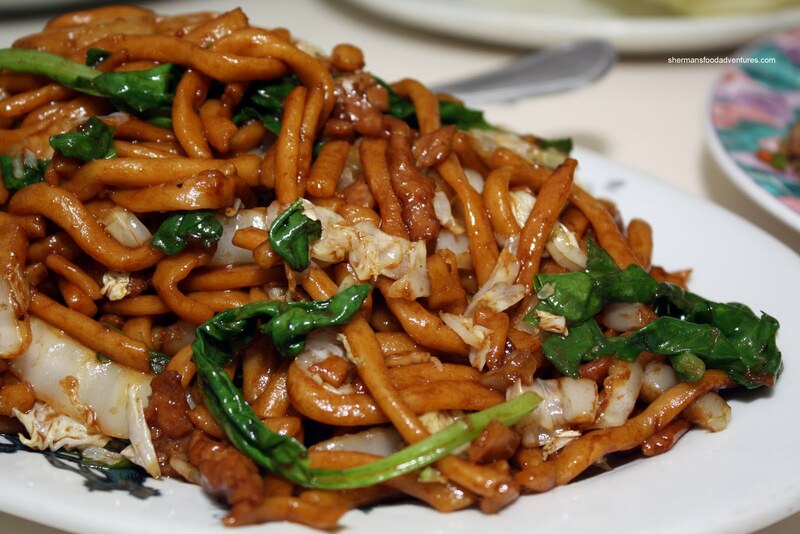 Our obligatory bowl of noodles came in the form of Tan Tan Mein. It consists of flour noodles topped with either a sesame or peanut based sauce. In this case, it was a slightly spicy peanut sauce topped with green onion and ground peanuts. Possibly because I ate it last, I found the noodles to be a bit soft. Otherwise, the sauce itself was decent with enough soy sauce to balance the peanut. 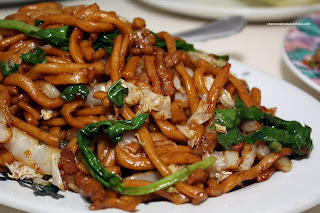 We also got the Shanghai Fried Noodles as a recommendation. Once again, I found that the noodles were soft. Other than that, the dish was quite alright. It had good colour, just enough dark soy flavour and plenty of spinach, cabbage and pork. Although the nature of this dish results in a large usage of oil (so the noodles don't stick), there wasn't an overload of oil in this case. Everyone knows the cliche, "save the best for last"; however, this really didn't apply. The Pork Chops & Sliced Rice Cake was terrible. I found the rice cakes themselves to be almost gummy rather than chewy. The pork chops were terribly over-tenderized resulting in a mushy texture. To top it all off, the sauce was just too sweet with little in the way of any other flavour. When we thought our meal was over, we got a complimentary dessert in the form of Pumpkin Rice Pastry with Red Bean. 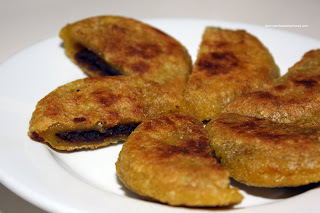 These were pretty good with a nicely pan-fried exterior and a soft rice flour interior. The red bean paste was only semi-sweet. Served hot, these little treats were a nice end to the meal. And about that meal... I gotta admit it was pretty average at best. Even the XLB were average. 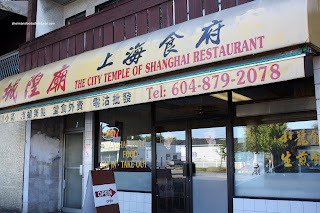 I mean, the pricing ain't bad and most of the food was very edible; but with some many choices for Shanghainese food in the GVRD, this would not be my first choice. I'd gladly pay a little more and head over to the nearby Shanghai Village or Lin instead. 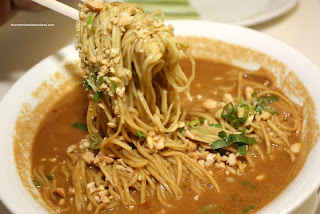 Since you mentioned Tan Tan noodles, this one looks pretty good. I was just wondering if you could recommend somewhere you consider has the best version in the GVRD, since the one in Richmond I used to go to is now gone. IMO, the TTN at Lin's (W. Broadway btwn Granville and Fir) is very decent. So does the one at Peaceful Restaurant (Broadway btwn Cambie and Ash). My Mom, being raised in Shanghai, likes the ones at Szechuan Chongqing and Lin's the best. Only the TTN I really liked. The XKHs were doughy inside and no significant fillings of any sort. Holly, I would second LR's suggestion of Lin. Not sure about the others since I haven't tried their versions. LR, so I'm thinking you are with me on this? CTOS = average? I don't know why you guys keep recommending Lins? I've tried all there food and it is quite average. There Shanghai Steam dumpling pork filling is the most bland taste I've ever had in GVRD. There Tan Tan Noodle is very typical and nothing out standing. There service is very awful at the least busiest time and they don't have anything that is a unique dish, that no other restaurant can make? P.S. One of the most awful ambiance I've ever been at! Well, one of the great things about food is that it is very personal. Thus, we all have our own likes and dislikes. Then, from that, you are right, I am right, LR is right and Holly is also right. There is not wrong. With that being said, I never have stated that Lin is the best nor is it in the eyes of most. For my current post, I am merely referring to better choices nearby CTOS. Personally, my favourite is Shanghai River in terms of overall quality, not necessarily the best XLB, TTN and so on. Of course, now some people will point out that SR is too expensive, crappy service and doesn't have the best XLB. That is a never ending debate. People are passionate about their food and each to their own. For myself, if I had to choose, I'd go to Shanghai River over all of the above. Not saying they are the best at everything. Just not terrible in anything and pretty solid. Of course, watch people disagree with me... LOL! Re: CTOS, yeah I'm with ya, bro ! CTOS is average strictly in the context of the so many other Shanghainese/Northern restos in town. I do like their homeyness (euphemism for hole-in-ground) and personal service by the owners. Their food is a wee bit hit & miss, I find that when they're busy, quality and consistency deteriorates. XLB in past experiences is good but I wouldn't say the best in Metro Vancouver. Same goes for several other menu offerings. BUT if I were in that part of Main St. and hunger pangs hit I would definitely stop in. I used to like Long's Noodle House at 33rd but I feel they've been selling out recently. Well... I'm not reading some random, co-worker, friends, lover, another person food adventure. I'm reading Sherman Food Adventures and your view is quite important because I agree with what you say and so does many people who view your blogs. You got to give yourself more credit! If you agree with OldtusRapper opinion, then we agree with Sherman. Angela: "If you agree with OldtusRapper opinion, then we agree with Sherman." Hey wut ?!? I'm not old ! Ok, not *that* old anyway, haha. Angela... LOL... I try not to take myself too seriously. So if you have a differing opinion, more power to you! I only express what I think so people can have their own opinion for sure. But yah, I do stand by what I say, so I guess you're right about it in some sense.